I have attached below a list of spelling atrocities that we've received from our guys in the field. On the left is their spelling. On the right is the correct spelling. (At least what we thought they meant to say.) We started the list off with “fule” and squeezed the rest in. I am not pointing the finger at anyone or assigning any kind of guilt. I, too, am a horrible speller. I am fortunate enough to be at a computer where I have beeping and red underlines to warn me when I am not using i before e. My guys in the field fill out their paper work in the dark after ten hours of work. They don't have time to get out the dictionary and check for the correct spelling of the word "pay." As a matter of fact, you'll notice a few of the words have asterisk next to them. 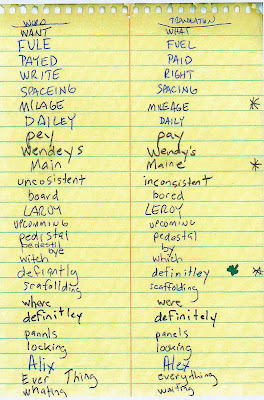 These are words I have misspelled as well. Especially mileage. You will also notice that “definitely” has a double asterisk next to it. That is because as I added it to the list and incorrectly spelled it in the translation column. My co-workers noticed this and started a separate list of things I have spelled wrong while mocking others. The words “rite” or “write” or “right” were used interchangeably and incorrectly so often that they were retired from the list after the first week.